Hotel 81 Orchid is located in the vibrant Geylang, a 10-minute walk from Aljunied MRT Station. This cosy hotel offers affordable rooms and features easy access to the city centre.Orchid Hotel 81 is a 15-minute drive from the popular Orchard Road and the Central Business District. It is a 20-minute drive from Changi International Airport.Air-conditioned rooms at Orchid are equipped with satellite TV and a coffee/tea maker. Each room has a private bathroom with bathroom amenities and shower facilities.Luggage storage and safety deposit boxes are available at the 24-hour front desk. Laundry and fax services are provided. Guided sightseeing tours can be arranged at the tour desk.Geylang is a great choice for travellers interested in photography, sand beaches and monuments. The HOTEL 81 ORCHID is a Tourist hotel. Located in Orchard Road area. Shopping is accessible by bus/taxi and the nightlife/restaurants are within walking distance from the hotel. 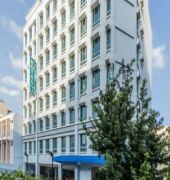 Descriptionclass="small" style="text-align: justify; font-size:11px;">Hotel 81 Orchid is located in the vibrant Geylang, a 10-minute walk from Aljunied MRT Station. This cosy hotel offers affordable rooms and features easy access to the city centre.Orchid Hotel 81 is a 15-minute drive from the popular Orchard Road and the Central Business District. It is a 20-minute drive from Changi International Airport.Air-conditioned rooms at Orchid are equipped with satellite TV and a coffee/tea maker. Each room has a private bathroom with bathroom amenities and shower facilities.Luggage storage and safety deposit boxes are available at the 24-hour front desk. Laundry and fax services are provided. Guided sightseeing tours can be arranged at the tour desk.Geylang is a great choice for travellers interested in photography, sand beaches and monuments.